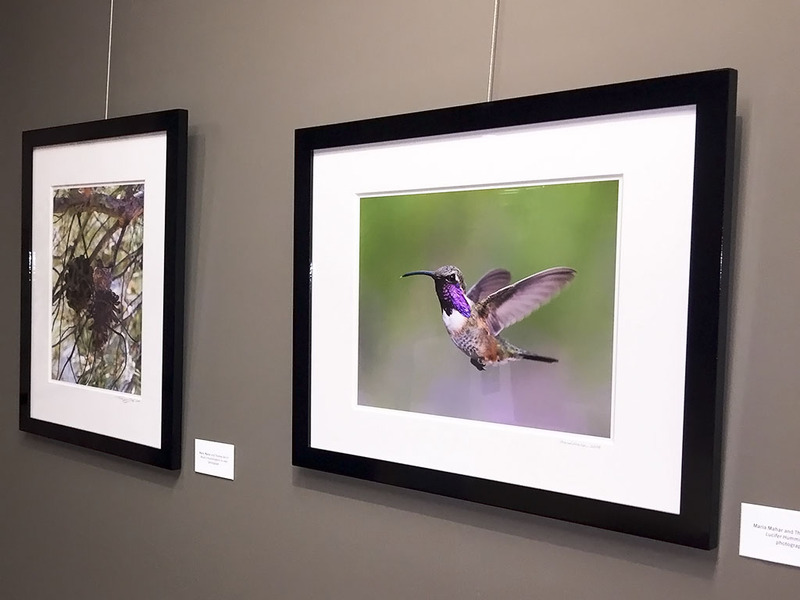 Hover: Hummingbirds in the United States is on display at the Tempe Public Library. 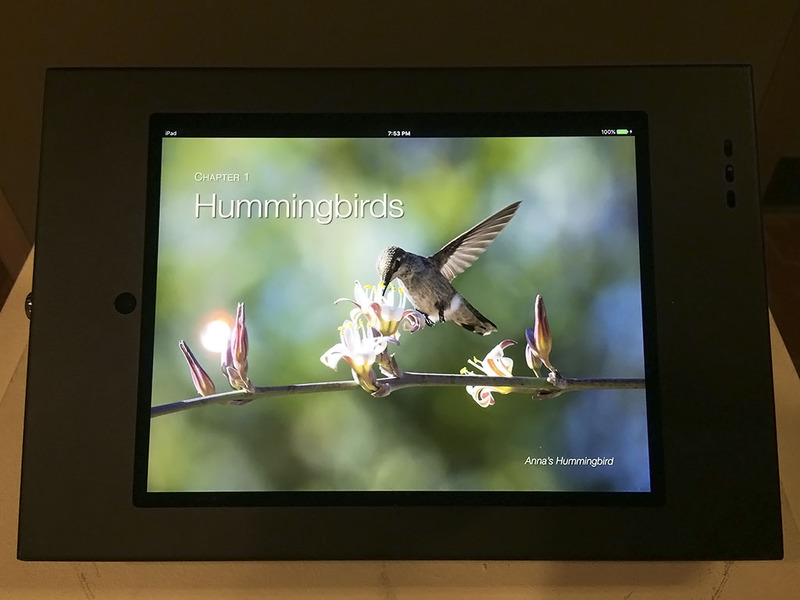 The interactive ebook is installed on an iPad, and it is ready to be explored. Look for slow motion hummingbird flight, beautiful colors, and the wonder of a hummingbird egg hatching. Hover is on display as part of an art exhibit in the Tempe Youth Library. The art show is titled “It’s a Wildlife”. The show features the work of April Howland, Maria Mahar, and Thomas Strich. April’s contribution to the show are her wonderfully bright and whimsical wildlife paintings. 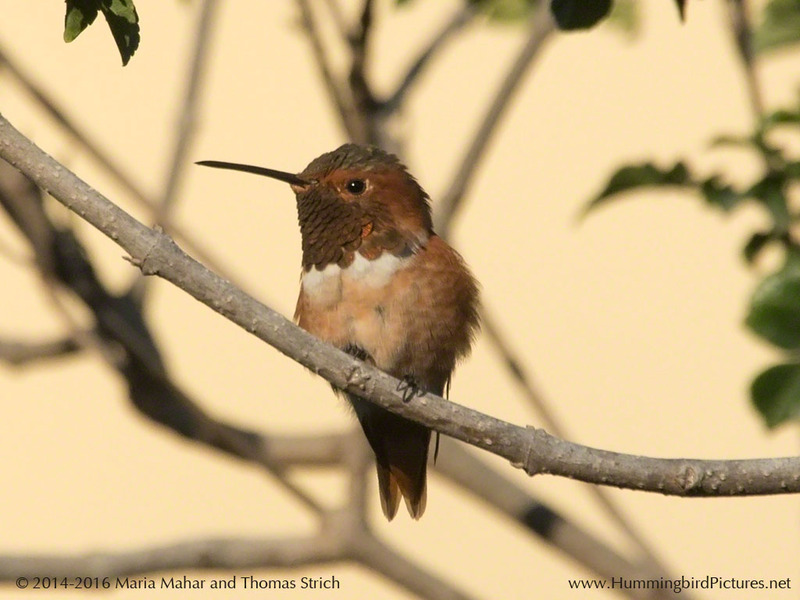 Maria and Tom’s contribution focuses on their work around hummingbirds in Arizona. 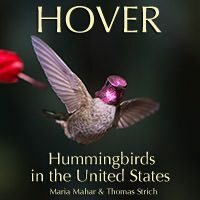 Their work includes hummingbird-related materials to engage and inform viewers through photographs, drawings (coloring pages), and slow motion video. “It’s a Wildlife” is on the lower level, at the main entrance to the Youth Library. Hover is in the open gallery area, available for any child or adult to enjoy. Look for the iPad case mounted on a low pedestal. As part of the show, Tom has provided free hummingbird coloring pages for adults and children. There are 5 designs – from simple to complex. The Library keeps copies available on the kiosk. Color pencils can be checked out at the Youth Desk. 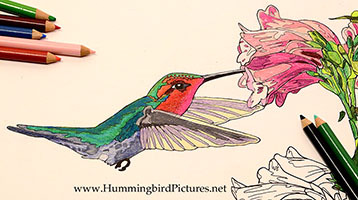 The original color photos are posted on our hummingbird blog. “It’s a Wildlife” is up through October 11, 2017. 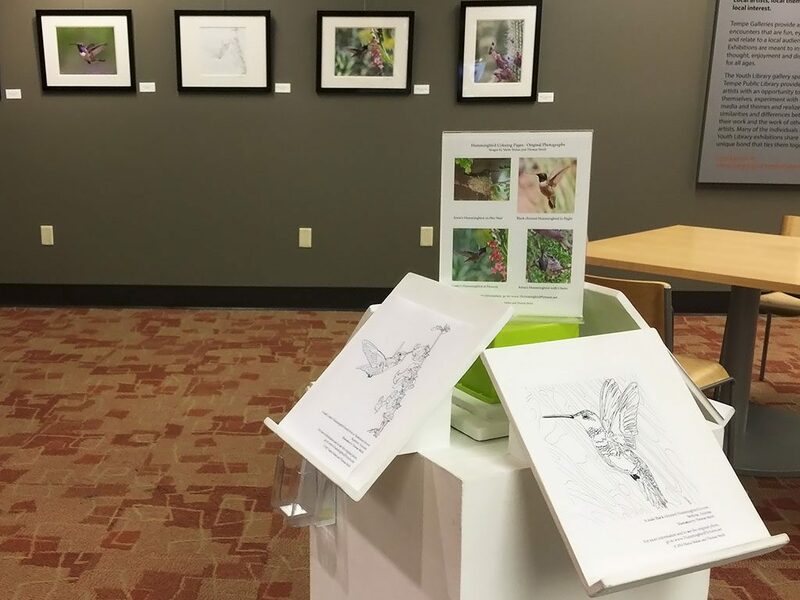 Come by, see the art work, and take home some free hummingbird coloring pages! 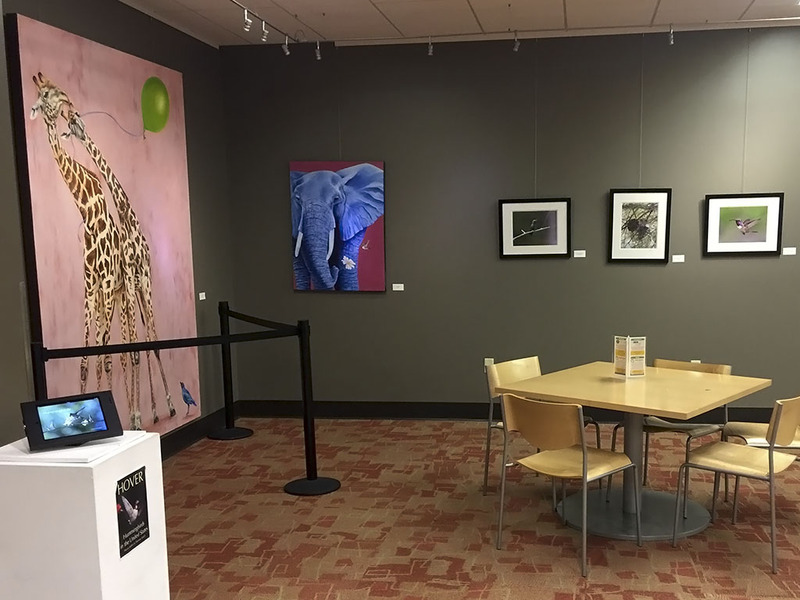 Thank you to the City of Tempe Youth Library management and staff and the Gallery at Tempe Center for the Arts management and staff for making “It’s a Wildlife” possible. And thank you to April Howland for her delightful work. Go here to see excerpts of Hover or go to iTunes to download a sample chapter. 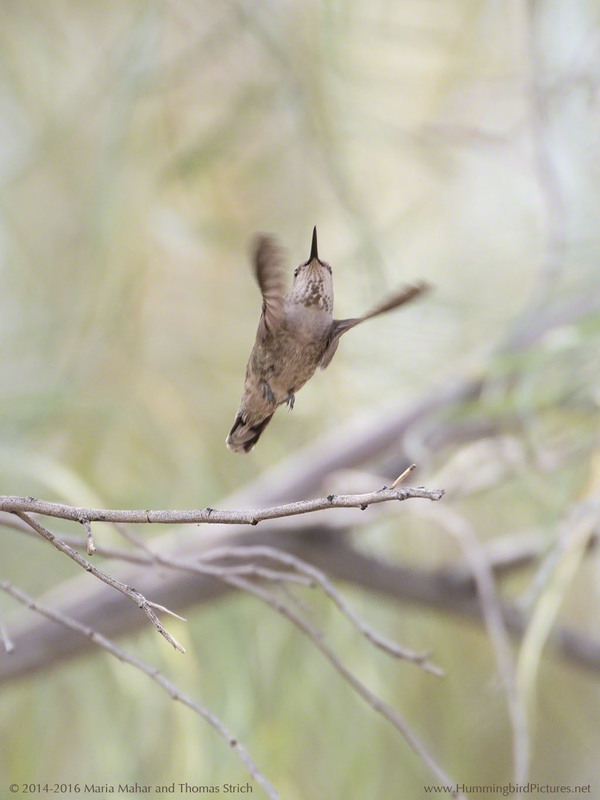 When a hummingbird takes off, it often appears to fly straight forward or straight up. We do not see a hummingbird make a big, obvious hop, followed by steady wing beats to gain altitude. A hummingbird has relatively small leg muscles compared to other birds. A hummingbird does use its legs, but the powerful flight muscles in the chest do the most of the work. 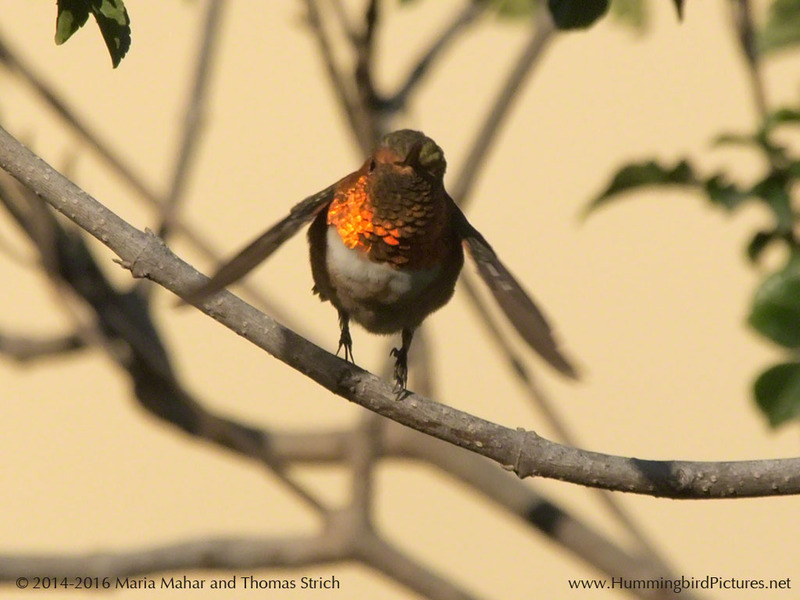 Those muscles, plus the hummingbird’s shoulder joints, make some dramatic take-offs possible. 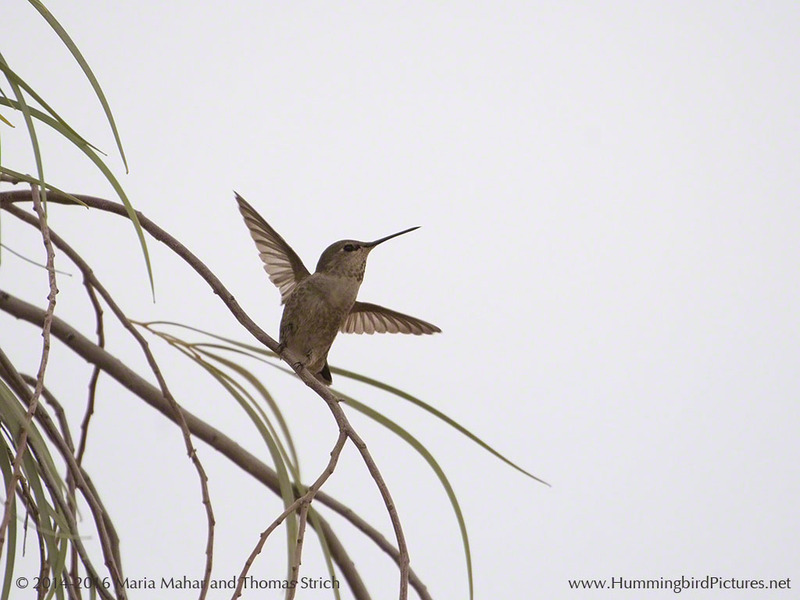 And maybe this Anna’s Hummingbird had a strategy – look at the position of the twig in the second shot. It is slightly higher than when the hummingbird was on it. 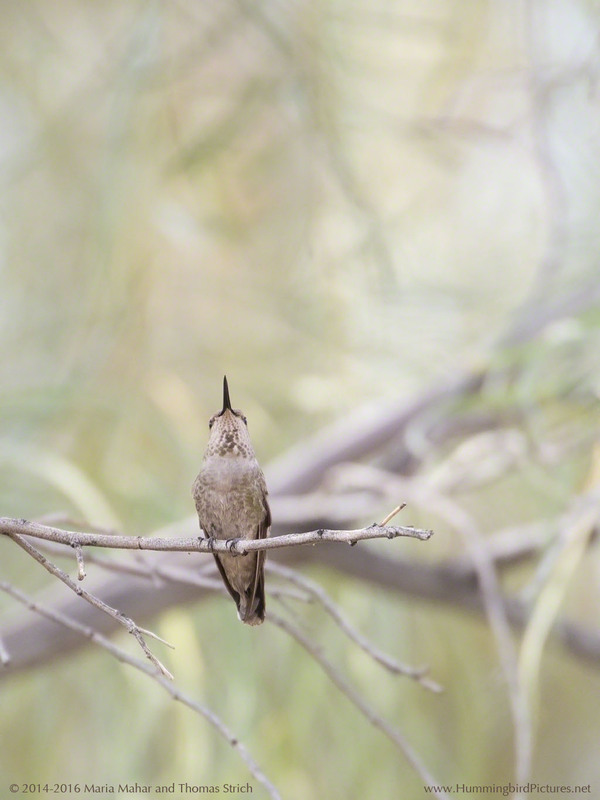 We have noticed that a hummingbird will sometimes perch on a small twig that springs back as the bird takes off. Maybe a little extra boost on launch? Back to hummingbird pictures blog or home. It’s cold outside, and the hummingbirds feel it. 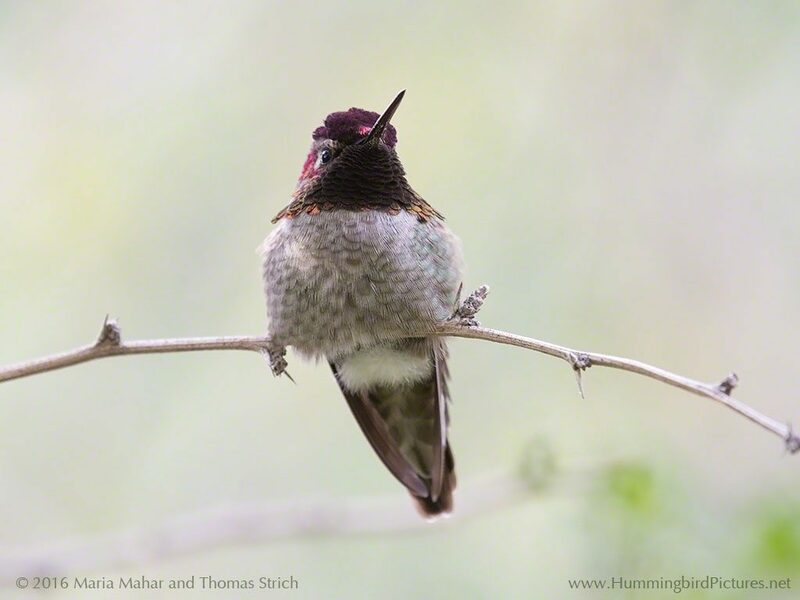 Like other birds, a cold hummingbird fluffs its feathers to keep warm. 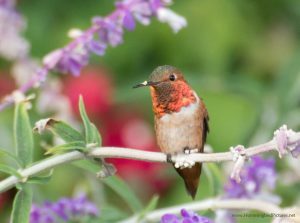 The fluffed feathers trap warm air from the hummingbird’s body. This male Anna’s Hummingbird is perching so that his fluffed feathers also cover his feet. We also notice that our resident Anna’s Hummingbirds always seem a little more round during the winter. They obviously gain weight. A layer of fat is good insulation and a good source of emergency energy. We have not seen any hummingbirds in torpor here. But sometimes a cold hummingbird will sit on the feeder for a long time, not drinking, not looking around, just spacing out. 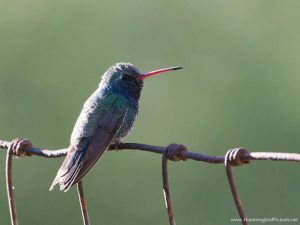 If you have hummingbirds over this winter, here is post about helping hummingbirds in cold weather by Sheri Williamson, author of a Field Guide to the Hummingbirds of North America (this book is one of our favorite guides – our hummingbird gift ideas shows more of our favorite resources). Happy winter and stay warm! Back to the hummingbird pictures blog or home.